This wonderful horse trek will give you your share of adventures. During those 10 days, we will first take you to Bogd Khan Uul national park and its Manzushir Buddhist Monastery. Then you will head to Terelj national park, home of the famous Turtle Rock and Meditation temple. Later, you will pay a visit to the legendary Genghis Khan Statue who will give you encouragements for your riding. After this you will cross the Tuul river and visit nomadic families who will offer you some milk tea. Most of the time, grazing yaks and horses will be seen in the park. At the end of each day you will set you tents under Mongolia’s beautiful sky. Did you know you will be able to see the Milky Way? Your guide will prepare a nice meal before a last card game or song next to the fire. Are you ready for total immersion in nature and unforgettable memories? Day 1. Bogd Khan Uul National Park. Day 2. Manzushir Monastery, Bogd Khan National Park. Day 3. Tuul River Valley. Day 4 – 5. Terelj National Park. Day 6. Genghis Khan Equestrian Monument. Day 7 – 8. Bogd Khan Uul National Park. Day 9 – 10. 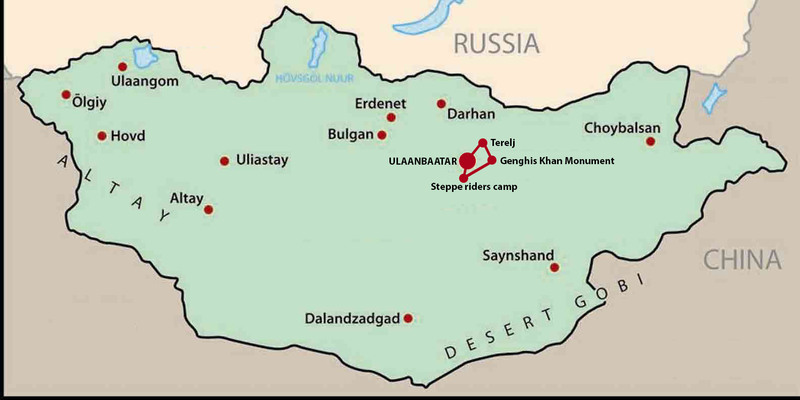 Head Out to Steppe Riders Base Camp. Day 1. Horse Trekking to Bogd Khan Uul National Park. 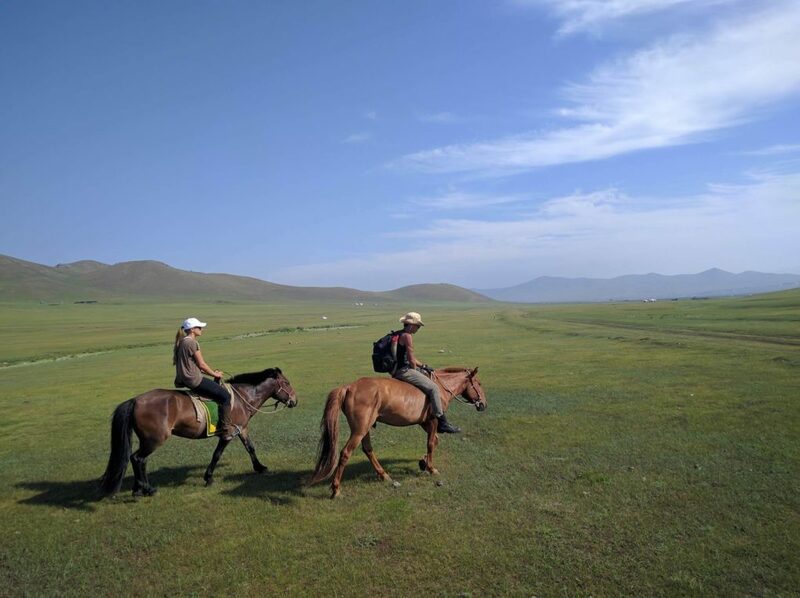 We will depart from Stepperiders camp and ride through a beautiful valley to the forested mountain of the Bogd Khan National Park. Camping overnight in tent, around the fire under starry night. Tenting, B+L+D. Day 2. Horse trekking to Manzushir Monastery in the Bogd Khan National Park. Today we will ride deeper into the national park to reach Manzushir monastery. We will explore the 17th century built Buddhist monastery ruins and its local museum. Afterwards, we will ride towards a new camping spot in the national park. Tenting, B+L+D. Day 3. 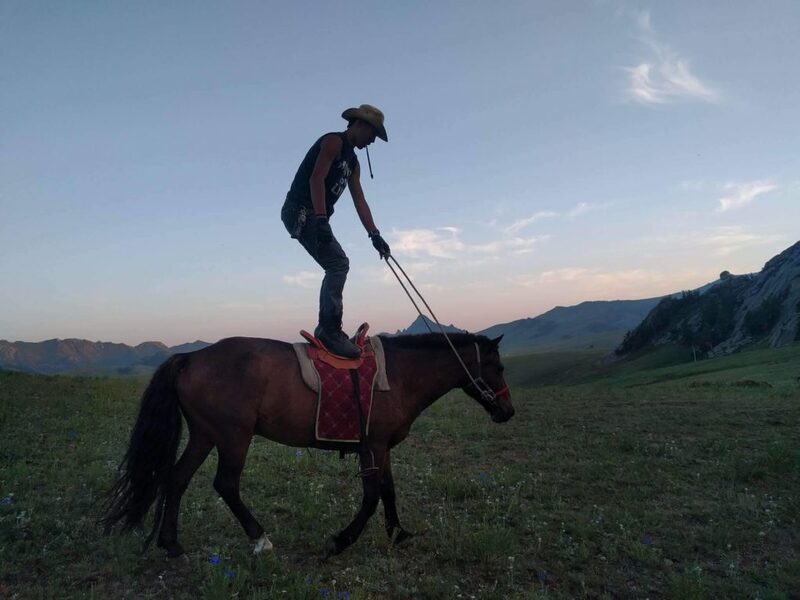 Horse Trekking to Tuul River Valley. In the morning, we will ride down to the open valley of the Tuul river. It is the perfect place for some long galloping with our amazing horses. We will stay overnight at bank of the Tuul river side. Tenting, B+L+D. Day 4 – 5. Horse Trekking to Terelj National Park. Those two days will be spent in the famous Terelj national park, one of the top scenic attractions near Ulaanbaatar. You will discover the Turtle Rock nature formation and visit the Meditation temple. Afterwards, we will ride down to the riverside and stay overnight in our tents, in this beautiful park. Tenting, B+L+D. Day 6. 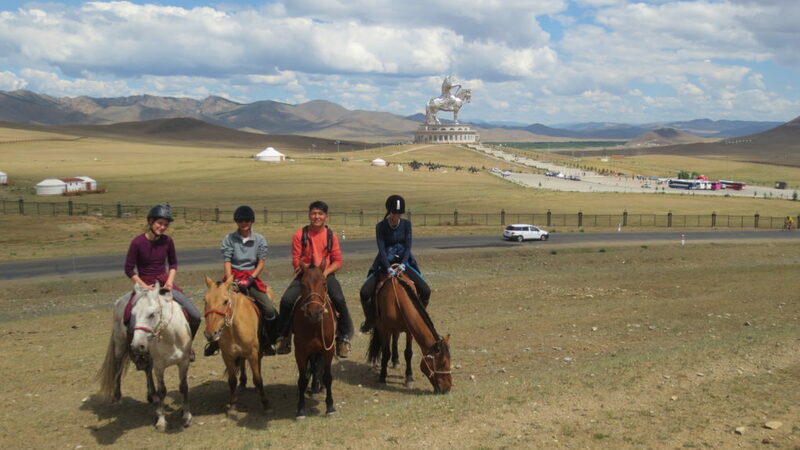 Horse Trekking to Genghis Khan Equestrian Monument. Today we will ride to the famous Genghis Khan horseback statue complex which is the tallest man on horseback in the World now. We will cross the Tuul river on horseback and reach this monument to visit its inside museum and explore the surrounding. Then we will walk on the statue’s horse head and see the panoramic view of the national park. We will ride to move our camping places, stay overnight at tents, under starry night. Tenting, B+L+D. Day 7 – 8. Way Ride Back to Bogd Khan Mountain National Park. We will have 2 full days of riding back to the Bogd Khan national park. But we will ride through different way in mountains. It will give you another chance to gallop in the open steppes. Overnight in tents, in the vast steppes. Last day, we will reach the national park and enjoy from its scenery again. Tenting, B+L+D. Last 2 full days ride to our starting point. We will enjoy riding through the valley of the Bogd Khan Uul national park and mountains. We will arrive at Stepperiders camp and finish our adventurous trek. Say goodbye to your awesome and unforgettable horses and crew. Stay overnight at the base camp or transfer to capital. May to October – contact us to book your dates. 7 – 8 pax: 810USD per person. 4 – 6 pax: 900 USD per person. 2 – 3 pax: 1.050 USD per person. 4 – 6 pax: 775 USD per person. 2 – 3 pax: 875USD per person. 7 – 8 pax: 590 USD per person. 4 – 6 pax: 650USD per person. 2 – 3 pax: 750USD per person.